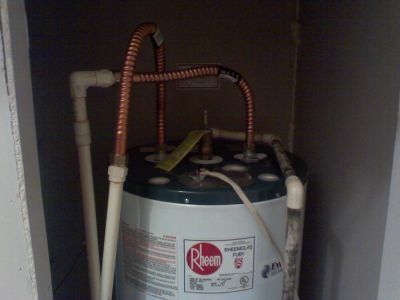 Arctic Fox Air Conditioning and Heating understands the importance of a properly operating water heater in your home. A water heater that is working correctly will provide hot water for the laundry, the dishes, or a luxurious shower. A water heater that is not working properly can potentially be harmful to your home and family. The water heater professionals at Arctic Fox Air Conditioning and Heating work on gas and electric water heaters. Every water heater job that we take on is given great attention to detail to ensure that your home's water heater is operates properly, efficiently, and safely. Talk to us about installing the brand new Heat Pump Water Heaters that takes the heat from the garage and transfers into the water. This type of water heater can reduce energy costs by up to 50%. Arctic Fox Air Conditioning and Heating can also install a water heater timers to help reduce energy costs. A water heater timer extends the life of the water heater including the elements. Arctic Fox Air Conditioning and Heating is skilled at making repairs to both gas and electric hot water heaters. These two different types of hot water heaters require specific attention to make sure that all repairs are done to minimize future problems. Gas Water Heaters – This type of hot water heater is designed with a gas valve that cycles itself on and off as the water heats and cools in the tank. Most gas water heaters have a pilot light that heats the tank at the bottom. The pilot flame is controlled by a thermocouple. Gas hot water heaters are built with a safety valve, usually located on top, which controls water pressure. If the pressure in the tank of the gas water heater gets to high, it will open allowing the water to safely be discharged to an area that will do no damage. Gas hot water heaters are also built with a flu that discharges the harmful fumes to the outside of your home. Arctic Fox Air Conditioning and Heating is highly trained in all aspects repairing gas hot water heaters with a focus on professionally making repairs and providing you with a safe and reliable hot water. Our technicians go through a complete checklist when diagnosing your gas water heater to make sure that all important components are operating properly. Electric Water Heaters – Electric hot water heaters use heating elements to create hot water. These elements are located on the top and bottom of the water tank. Both heating elements are controlled by thermostats to keep the water at the desired temperature. Just like gas water heaters, they are protected by a temperature and pressure relief valve. The technicians at Arctic Fox Air Conditioning and Heating are trained to make professional repairs to electric water heaters. We can replace thermostats, heating elements, temperature and pressure valves, dip tubes, and anode rods. A common problem that we fix is the drain at the bottom of the electric water heater tank. This is remedied with the installation of a new drain valve. An Arctic Fox Air Conditioning and Heating technician can provide periodic water heater maintenance service for your home's gas or electric water heater. Ask your Arctic Fox Air Conditioning and Heating technician for more details on specific water heater maintenance programs that are available. During a maintenance service on an electric hot water heater, we inspect the temperature and pressure relief valve to make sure that it is not seized up. Both the top and bottom heating elements are inspected for proper operation. The water from the tank is drained through the bottom drain inspecting the contents for any abnormalities. Finally, we check the emergency shut off valve directly above the tank of the water heater to make sure that it working properly. On gas hot water heaters, the technicians at Arctic Fox Air Conditioning and Heating give special attention to all fixtures that bring gas into the burners. This includes inspection of the burner, the flue, and all piping and connections that the gas flows through. We use a meter to detect any carbon monoxide leaks. We also inspect the temperature and pressure relief valve and emergency shut off valve for proper operation. Finally, we drain the tank of the water heater to remove sediment from the bottom. When your home's water heater does fail, the first call to make is to Arctic Fox Air Conditioning and Heating. One of our water heater technicians will quickly come to your home, stop the leak, and clean up any standing water. We'll completely drain the old water heater and haul it away. Our technicians can install either a new electric or gas water heater in your home. If a new gas water heater is being installed, we will install new supply lines and gas flex lines. For both gas and electric water heaters, a new water shut off valve will be installed. Your Arctic Fox Air Conditioning and Heating technician will re-pipe the temperature and pressure relief valve and thoroughly inspect the water heater for any leaks. Installation of a new gas or electric water heater is a relatively short process, so don't delay. Call Arctic Fox Air Conditioning and Heating today. Give Arctic Fox Air Conditioning and Heating a call today for any gas or electric water heater repairs or installations. Our water heater technicians proudly serve the Glendale, Surprise, Phoenix, Sun City, Peoria, and all other communities in the West Valley. Call us at 623-533-5718 today. You can also reach use with any questions that you may have about water heater repair or installation through our Contact Us page.